There’s nothing like a swim in zero-degree-temperature water to wake up a body – especially when followed by a jacuzzi with glacier views. Caroline Berdon explores the icy beauty of Antarctica from both land and sea. I stand on the marine deck of the expedition ship in my bikini, ready to jump into the dark grey chop of the Southern Ocean. I’m mustering up a little courage: the air temperature is below zero, an icy wind is whipping my bare stomach, and there’s a small crowd of people staring at me. These vast waters at Cierva Cove off the Antarctic Peninsula are hardly the Whitsundays. 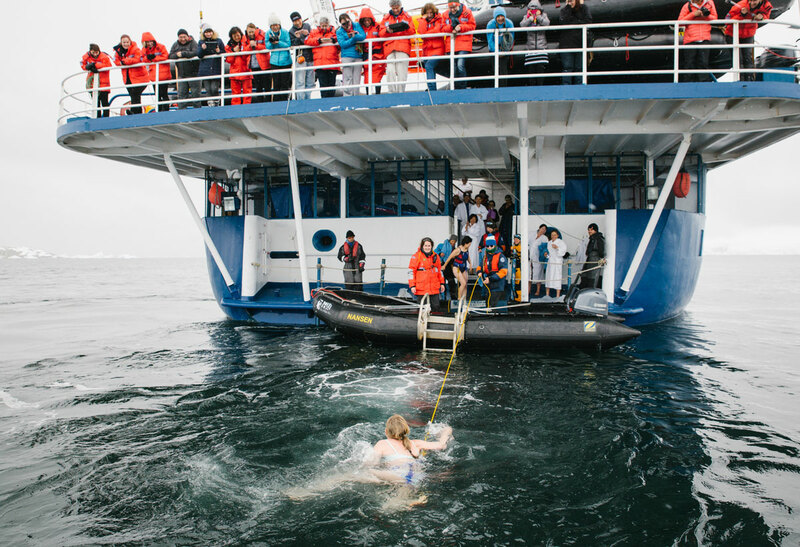 Distant icebergs and drifting pack ice bellow of what this zero-degree-temperature water is capable of – apparently it could turn a body rigid in four minutes. Hence the crowds. This is no place for a peaceful, solo swim. I even have a canvas belt around my waist attached to a rope in case the Poseidon Expeditions crew needs to pull me out. Then I jump, feet first, pushing away from the ship as far as I can. The cold bites my skin and takes my body. The water looks almost black, but also appears amazingly clear and clean. I lurch into a messy freestyle for five or six strokes before stopping to take it all in. The first thing I notice is my distance from the ship – perhaps 20 metres; the current is stronger than I thought. Then I clock the concerned faces of the crew, who start to tug at the rope attached to my belt. I swim back to help them but already my body feels heavy and slow. And when I’m out of the water wrapping myself in a towel, I’m shivering and shaking and talking in gasps. It’s short-lived, of course. I’m soon cradled in the warm bubbles of the jacuzzi on Sea Spirit’s top deck, our cheery barman Sixto handing me the shot of Argentinian Patron tequila I’d ordered for after. I sink down alongside fellow elated jumpers – a couple of Germans, a Liverpudlian and a Chinese-American – to absorb the late-afternoon beauty. A misty grey sky hovers like tissue paper over a bright, white sun. Silvery rays are breaking through here and there, flickering on the waves and darting across lonely glaciers on the horizon. As views from tubs go, it’s out of this world. In true Antarctic style, a new weather front is on its way. A wind is building, carrying rain and sleet, and a swell is rising in the grey water. Within minutes my bubble buddies have departed and I take in the scene alone – which often I prefer because it makes me feel more vulnerable and in this way, the conditions more magnificent. It’s Antarctica’s unpredictable weather that prevents us camping. The winter has left floating pack ice yet to melt and if we stay on land overnight, there’s a danger we could get iced in. While our ship is ice classed (which means its hull is strengthened to navigate through sea ice), it’s no icebreaker. I can’t help my disappointment. I was excited about digging an ice pit, lying out in the open in my bivy bag and experiencing the brief twilight that is an Antarctic summer’s night. At least a good sleep in a warm, blacked out cabin readies you for trekking, which is so varied on the Antarctic Peninsula and its surrounding islands. During our six days here with Chimu Adventures, we wander past penguin rookeries and sleepy elephant seals laid out like bread dough; we walk on crunchy volcanic beaches and climb snowy glaciers. One of my favourite treks is at Orne Harbour, which marks our first landing on mainland Antarctica. In a wind chill of about minus 10C, we trudge up a mountain through snow that’s thigh-high in parts (there’s always an option for less able travellers, who can walk on the flat near the shoreline). The blizzard feels fast and fierce on this exposed side of the glacier. It cracks our lips, burns our skin and white-cakes any hair showing through hats, hoods and scarves. It also temporarily destroys our cameras, so we tuck them up under our jackets and ignore them. The expedition team have laid out a zigzag of red flags for us to follow for our safety and as I reach the top, I collapse into the soft, squeaky white. Through goggles and whizzing snow, I look down the steep glacier to jagged ice as it falls into the dark sea, and make out our tiny Sea Spirit at the other side of the bay. The weather and light in Antarctica is always changing, and has been doing so like this for centuries. It’s another world from my life back home. It is pristine and unspoiled. It is inhuman. And in some ways it feels hard to connect with. To have dug into its surface and dipped into its waters has been an amazing way to penetrate even a tiny part of this place, and I feel so privileged. Just sitting still for a while, on a mountain in a blizzard, is a chance to breathe it all in. Getting there: Qantas, Latam and Air New Zealand fly from the east coast of Australia to Santiago and Buenos Aires, where you can connect to Ushuaia or Punta Arenas. Puntas Arenas in Chile offers flights to the South Shetland Islands, where passengers board their ship. The upside of flying is avoiding the infamously choppy Drake Passage. But this option is more expensive and flights across the Drake to Antarctica are highly dependent on weather conditions and are frequently delayed or cancelled. Ushuaia in Argentina is the major gateway for cruises to the Antarctic Peninsula as well as sub Antarctic islands such as South Georgia and the Falkland Islands. Cruises last between 10 and 21 days. Crossing the Drake takes between one and a half to two days. Playing there: The Antarctic tourism season runs between November and March, when the days are long, temperatures nudge above freezing and sea ice melts enough to allow access. Early season is best for huge, dramatic icebergs and thick, pristine snow, but sea ice can prevent ships penetrating too far south. Later in the season opens up greater accessibility and the slightly warmer temperatures bring with them whales, penguin chicks and seal pups. Antarctica cruises with Chimu Adventures start from around $A13,090, including accommodation in Ushuaia on the night before embarkation. For more information, visit the website. The writer travelled as a guest of Chimu Adventures.